War Between Mamta and CBI Escalates : What Stars Foretell ? My Predictions inspite of incorrect horoscope of Mamta Banerjee , but the use of Transit may prove on dot it so seems . Read this Article “NRC Row 5 Cases registered against Mamta Banerjee What Stars Have Up Their Sleeves for Her ? link https://www.astrodocanil.com/…/nrc-row-5-cases-registered-…/ It seems she will be in hot waters as mentioned in the Article. 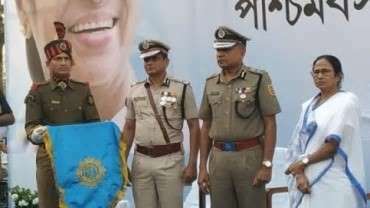 Sunday’s unprecedented showdown between Kolkata Police and the CBI started at around 5pm when the federal anti-corruption agency’s team reached the residence of city police commissioner Rajeev Kumar, said officials familiar with the development. And in retaliation against the action by the Central Bureau of Investigation at Kumar’s residence, Kolkata Police also sent its teams at the offices of the agency in the city and the residence of CBI’s West Bengal unit chief Pankaj Srivastava forcing him to lock himself up for more than three hours. Shrivastava apprehended his arrest by the city police, added officials. Lagna is signified by the Attacker King and hence the CBI and the Defender by the 7th House. Houses 9th to 2nd House are the houses of the Attacker and 3rd to 8th house are the houses of the Defender. Although all the benefics are for the defender there are parameters which may attribute finally for the Attacker since the Jupiter and Mars single Parameter for the win of the Attacker .Movable Lagna and Moon in Fixed Navamsha the enemy arrives and Bad for the Defender finally. 1.The Day is Sunday and the Lord is Sun placed in the 7th house with Lagna Lord and Ketu, Sun is placed in the yama of Virgo which is aspected by Strong Yoga Karka Mars who is also the 10th Lord and also connected to the 6th Lord Jupiter since there is Exchange of the Mars and Jupiter Attributes strong results for the Attacker. 2.A Malefic in the Lagna and aspected by Jupiter is making the Lagna strong since Jupiter will aspect the Lagna by the 9th strong aspect, 9th house where Mars is Placed by 5th aspect. 5. Between the Lagna Lord and the 7th Lord who so ever will be placed in the Kendra and with lesser degrees will be strong , hence Moon as the Lagna Lord acquires Strength and stronger then the 7th Lord Saturn, buit with malefic may offer hinderance in the win. 6. 7th Lord Saturn is placed in the 12th from the 7th house and in the 6th house makes it weaker. 7. Day Lord Sun is ill placed from the 8th house and the 8th Lord there will be fierce battle between the CBI and the Defender. 9.There is an ishraaf yoga of the Sun and Mercury and Mercury is the Lawyer of the Defender. The Judge will not agree with the Defender Lawyer, more so Mercury is also Combusted and ill placed from the 6th 7th Lord Saturn and also from the 8th house and the 8th Lord . 10. The Strength of the Lagna is More than the strength of the 7th house , When Lagna Lord aspects the Lagna the strength is good and is with a Friend Sun. Also Jupiter aspects the Lagna hence the strength of the aspect on Lagna is75% making the Lagna very strong , though all the benefics are placed on the side of the defenderhence some initial gains also. 12. Lagna is Prishtodayo and adhomukh but Rahu Shirshodayo and having aspect of Jupiter makes it strong. 13. Sun and Moon both in the Lunar signs are not good for the Attacker, hence some parameter which may be in favour of the defender to Prove himself of being innocent initailly. 14. Sun , Moon, and Ketu in the 7th house is not good for the Defender specially when Mercury the Benefic is weak and there is no aspect of a Benefic. 16. Lagna and Moon both in the Movable sign another date will be given, more so since the 7th Lord is placed in the 6th house and the dispute will prolong. 18. The Good Part for the Plaintiff Moon will be in Dhinashta Nakshatra and seems when it goes in the Uttra Bhadra Nakshatra the Verdict may be given finally . Mars the Strongest Planet at the time of the conflict will be in its own house in the 10th house of Battlefield, hence win of the CBI finally. The Central Bureau of Investigation (CBI) has filed an interim application in the Supreme Court seeking directions to the West Bengal government and police to cooperate with its investigation of the Saradha chit fund case.